Adept PDF Layout Changer is a utility for customize the startup options for your PDF files. You may decide whether to hide toolbar and menubar, display document title, resize window on startup, center window, hide window user interface or not. It can also reading and changing the PDF file properties / metadata information, including author, title, subject, keywords, etc. 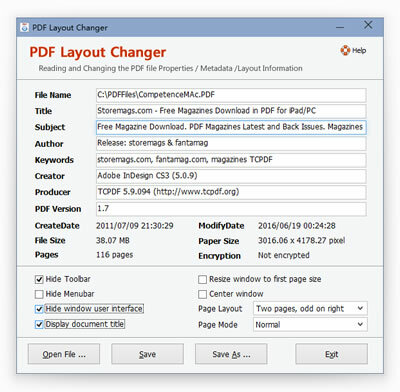 PDF Layout Changer does not rely on any other third-party software, of course Adobe Acrobat and Reader are NOT required.